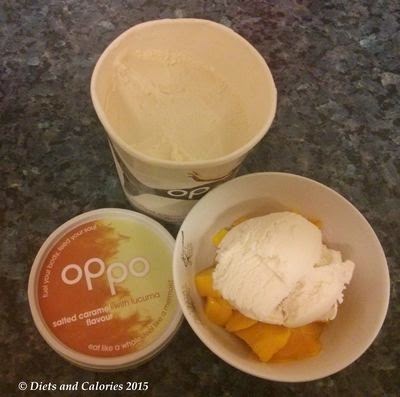 Over the years I’ve reviewed a fair few lower calorie ‘ice creams’ but this new ice cream from Oppo is by far the best. 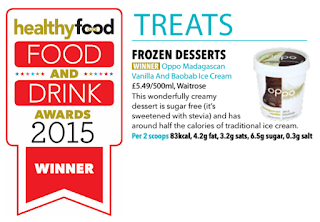 And since I wrote this review I'm happy to say they've won a healthy food and drink award for 2015. Madagascan Vanilla with Baobab; Mint Choc Swirl with Spirulina and Salted Caramel Flavour with Lucuma. 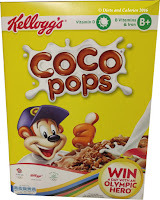 They’re made with natural sweeteners including apple extract and stevia as well as virgin coconut oil. Each variety has a form of superfruit or superfood so there are added health benefits too. 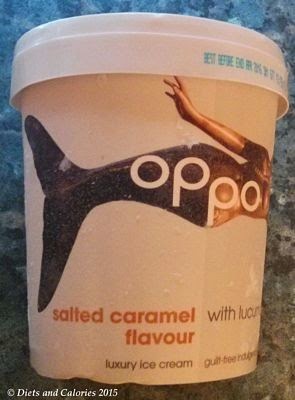 For my first purchase, I opted for the the Salted Caramel which has 77 calories per 2 scoops. 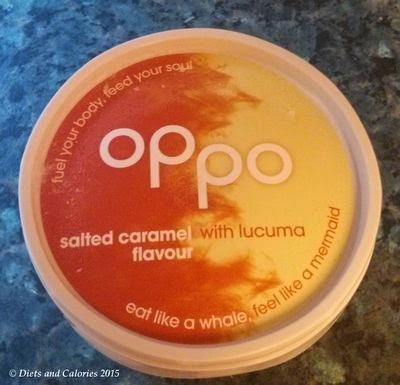 Salted caramel is such a gorgeous flavour combination so I was hoping Oppo would meet my expectations. 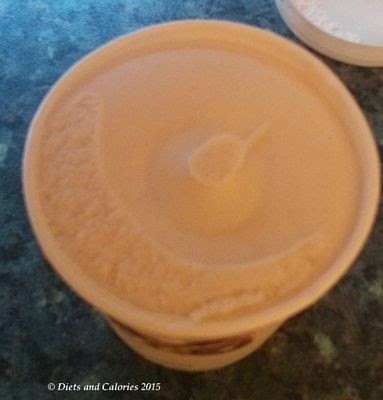 Opening the lid reveals a pale golden swirl of solid ice cream. I can faintly smell the caramel sweetness and can’t wait to tuck in. However, it’s not easy. 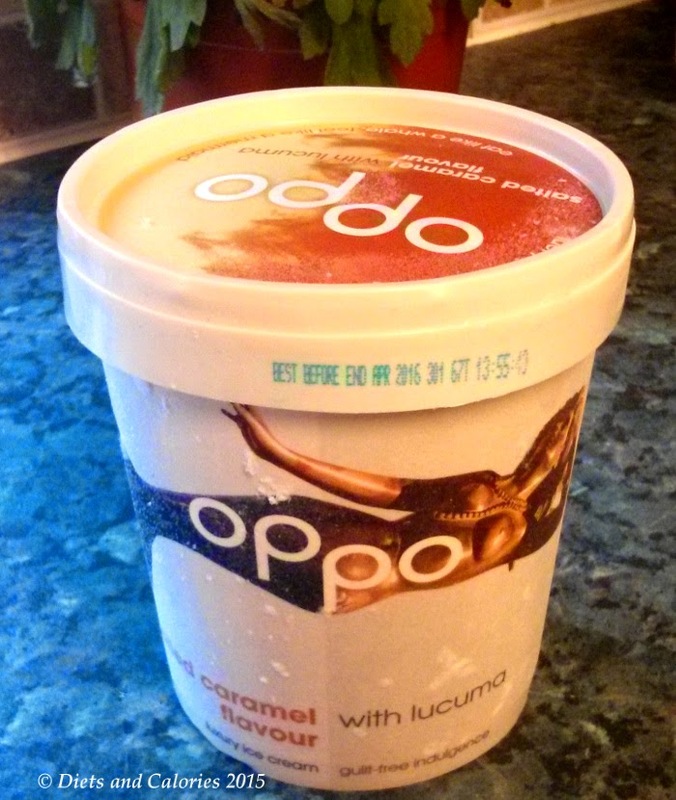 Straight out of the freezer, Oppo is truly solid. Digging my teaspoon in made little headway. Upgrading to a larger spoon fared little better. In my impatience, I resorted to a knife and began chiseling my way in. At last, I managed to prise a small chunk away from the sides and quickly popped it into my salivating mouth. OMG. What a taste sensation. 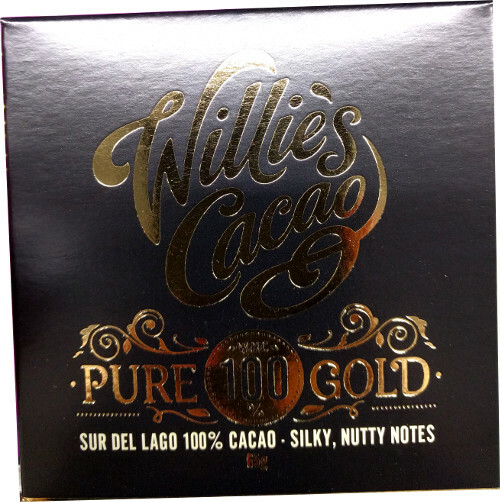 I just let it melt on my tongue, enjoying the incredible sweet, buttery caramel flavour. I immediately chiseled some more. This is definitely one of the most delicious ice creams I've tasted, and not just in the low calorie range. That’s just a bonus. The fact that 2 ice scream scoops has only 77 calories is amazing. 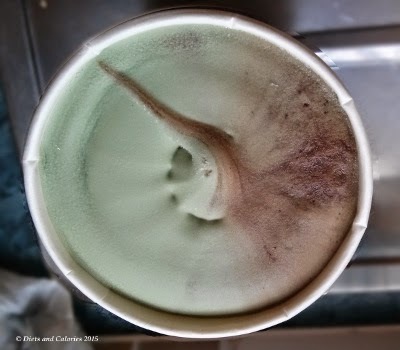 It’s a good thing this ice cream is hard to scoop out as it would be so easy to scoff the lot in one go. 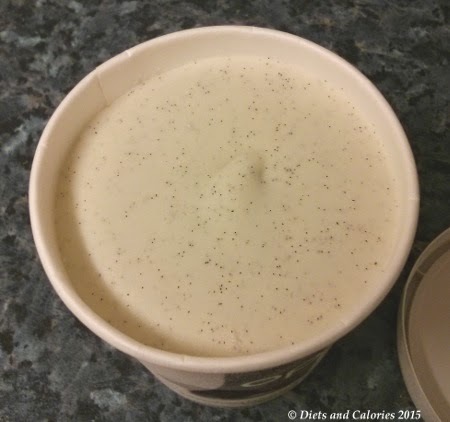 What you have to do is leave it out of the freezer for around 10 minutes to soften or in the fridge for half an hour. Then you have to make sure you use all the ice cream which has softened enough so you don’t re freeze it when putting the rest back into the freezer. 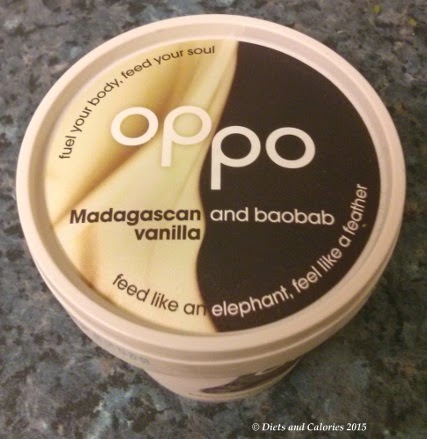 The other varieties - Mint Choc Swirl with Spirulina has 75 calories per 2 scoops and the Madagascan Vanilla with Baobab has 82 calories. 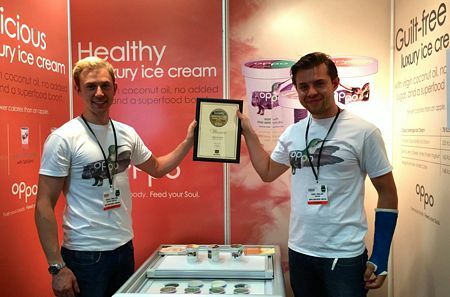 The ice cream was created by two brothers. Their story, which you can read about on the website, outlines the high and lows of their endeavours to develop the ice cream. At one point they were down to just £1.05 in the bank after a failed ice cream batch spewed out £8,000 worth of ice cream all over the floor! It’s an amazing story and I‘m so glad they persevered, enabling this gorgeous ice cream to come into fruition. This might sound like a sponsored post, but honestly, it’s not. When I really love a product, I have to rave about it. Small start up companies like this one really deserve to do well especially as they've got so much competition from the big guys. They also deserve a cheer for using natural stevia to sweeten the ice cream rather than resorting to cheaper artificial sweeteners. 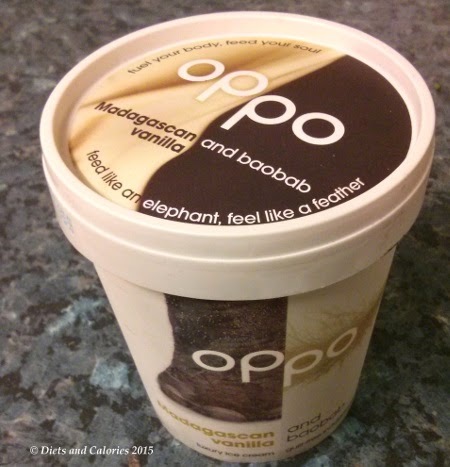 At the moment Oppo ice cream is only sold in branches of Waitrose in London. But Ocado online sell it in all their outlets. Hopefully word will catch on, and some of the other stores, like Asda, Sainsbury’s, Tesco and Morrisons will stock it too. It costs more than I would normally pay, currently £5.49 for the 500ml tub, but it's totally worth it. PS. 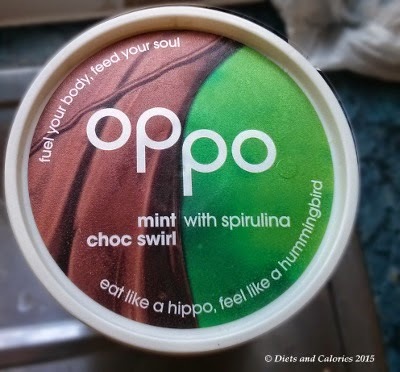 I've just bought the Mint Choc Swirl with Spirulina shown above but I haven't yet tried it. Can't wait! PPS, I've also tried the Oppo Vanilla. Incredible! so is the Mint. Nutrition information per 100ml: 77.3 calories, 3.2g protein, 7.6g carbs, 6.7g sugars, 3.8g fat, 2.8g saturates, 0.1g sodium. 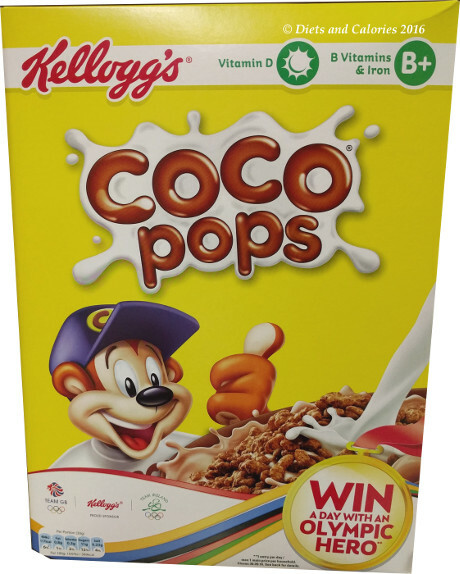 Ingredients: Whole milk, milk solids, natural sweetener: erythritol & steviol glycosides (Stevia leaf extract), natural fruit extract (apple and grape), virgin coconut oil, lucuma, cornflour, emulsifier (mono and diglycerides), stabilizer (locust bean gum, guar gum, carrageenan), natural flavouring, sea salt (0.2%). The Oppo Ice Cream guys! Still got my fingers crossed for sugar free ice creams to be readily available!